By undertaking that process (asset valuation), the Partnership Group coached us to develop an entirely new way of approaching sponsorship ... today, we are building programs that extend up to five years, and through the partnerships we are developing, we are a stronger organization. With excellent commitment to service, they over delivered in providing industry standard valuations on more assets than we expected so that we are best positioned for success in the future. The Partnership Group - Sponsorship Specialists™, have been essential contributors to initiating the City of Pointe-Claire’s sponsorship program through an inventory asset valuation process. I highly recommend Chris and the Partnership Group Services. What they teach works! 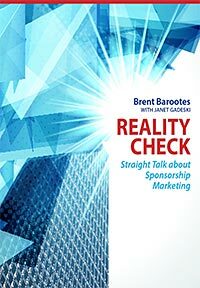 Brent and his team have helped us thoroughly understand the world of sponsorship ... his book Reality Check is on my desk because I refer to it frequently. What they teach works! I would highly recommend the Partnership Group for any organization looking to take their sponsorship revenue to the next level. Partnership Group provided us with a thorough and timely valuation for approaching the renewed sponsorship, identifying opportunities and assets to consider with the new stadium. The Partnership Group was instrumental in the Calgary Zoo choosing them to conduct a recent inventory valuation. The training and support from the Partnership Group that The Canadian Red Cross has received in Saskatchewan has paid off many, many times over. I feel more focused in our marketing and sponsorship efforts ... We feel better equipped to evaluate and decide on marketing and sponsorship opportunities. I have and would continue to recommend The Partnership Group for any organization who is considering a new partnership program. They have a very sound model of helping you enter the sponsorship world in a professional way. We are now armed with the materials and the understanding to grow our sponsorship base. I would recommend their work to other properties or municipalities who want to gain a thorough understanding of not just what they have to offer a prospective sponsor but the associated value. Derek Kwasney - The Lake Louise Ski Area Ltd.
Partnership Group provided us with a tool that is extremely valuable and will enable us to increase revenue for the organization. The Partnership Group - Sponsorship Specialists™ continue to be a fabulous resource for us as we grow our regional sponsorship program. Whether it be mentoring on prospecting and negotiations or strategically analyzing the marketplace they are a tremendous wealth of information from which to draw. We have a real market value on our property now, and with this, we will be able to help our sponsors generate good Return on Investment (ROI), something that they have been pushing us to do over recent years. Using the skills you taught me ... I was able to bring a number of new sponsors onboard ... most recently, I was able to secure a credit union for a Platinum Sponsorship of $10,000 per year for six years. Since implementing this process, the Enerflex Super Cities WALK for MS was able to successfully secure a 5-year title sponsorship at an increased financial commitment totaling $250,000. As a small non-profit with a big vision for the future, Brent has helped us develop effective strategies to involve corporate support in ways that we had not considered before. Your direction, guidance and building of the sponsorship program were essential to our overall success. The Games secured over 125 sponsors that varied from local to national sponsors and at investment levels from $500 to over $750,000. The Naming Valuation Report you completed for our new Centre for the Arts and Communication is an important first step for our college in valuing all our properties. We have much more confidence in understanding what we could, and should, ask for based on an extensive inventory of opportunities we have learned we possess. The Partnership Group-Sponsorship Specialists™ are respected, well connected, and have a demonstrated, proven track record of achievement and success in our community. Brent's presentation brought the delegates a totally new set of ideas in the area of sponsorship. He really made our delegates think outside the traditional box in their sponsorship plans. We are now organized and efficient in sponsorship and can have all our events sponsored. This has enabled HRAC to partner with several different organizations in Calgary giving us the exposure and revenue we needed. Brent's enthusiasm and cogent analysis are proving invaluable for us as an organization. Their insight, experience, and industry knowledge has put our sponsorship program on a much more solid footing and we're raising more money for theatre goals and objectives, as a result. Brent's contribution to The Fire Within has helped us reduce risk increase ROI and, above all, maximize value to our sponsors. Brent's guidance and professionalism has been an invaluable resource as he is always available to help us with 'one-off' partnerships where we have needed immediate advice. We began to work with the Partnership Group-Sponsorship Specialists™. We never imagined how large and meaningful our inventory was! Today, we are seeing not only increased revenue but stronger partnerships. Through the sponsorship audit of our programs, we realized the Canadian Red Cross has much to offer growing organizations across Saskatchewan. We look forward to our continued and valued relationship with the Partnership Group. The experience, network, and professionalism that the Partnership Group-Sponsorship Specialists™ brings to the table in assessing value of sponsor potential, as well as building a sponsor program, is probably the best in Canada. Your team at the Partnership Group-Sponsorship Specialists™ delivered exactly what we were looking for! We really appreciate your advice and your willingness to “tell it like it is”. Your support and guidance have been an integral part of the success of our sponsorship program. Their workshops offer value and new insights for those working in fundraising/sponsorships at every career level from seasoned to beginner! The Partnership Group-Sponsorship Specialists™ were able to provide us with some exciting ways to potentially increase our sponsorship growth and maintain that growth. These folks are very approachable and are vigilant about sponsorship, which I love. It goes without saying that the Partnership Group-Sponsorship Specialists™ workshops and conferences certainly served me well in preparation for the pitch (and of course my real job). I would recommend you and your organization investigate opportunities to work with Brent wherever possible. The gains you will see WILL be measurable (but astounding nonetheless). I would be very willing to endorse them to others who are looking to garner greater knowledge of their sponsorship asset revenue opportunities." We have a substantially better understanding of how sponsorship fees are tied to value and value is derived from visibility, exclusivity levels, prestige of property, etc. It was tremendously helpful to have The Partnership Group - Sponsorship Specialists™ take a close look at what Hilborn Group had to offer from a sponsorship perspective and what it's worth to prospects based on a valuation complete with industry accepted formulas and visibility. The Partnership Group have given us the confidence to press ahead with the development of the policy with the assurance that no stone has been left unturned, and every opportunity has been identified. Beyond the Inventory and Valuation, their sponsorship workshops and congress have allowed us to deepen our learning and connect with the other properties and agencies and share lessons learned.